Support Portal Home » Hosting Guide » What is My Server Address? What is My Server Address? Many operations or tools which you may use frequently will require a way to locate your server in order to function. This includes, but is not limited to: FTP software, cPanel login URLs, webmail, and even software you host such as WordPress needs an address to locate your database. The address you will need to use depends on whether you are trying to access your server externally (e.g. from your computer, from another server, or from your phone), or internally (e.g. WordPress plugin connecting to your email account or any software that needs to access a database on the same server), and whether or not a username and password are required. When attempting to reach your server, the server needs to be able to identify the hosting account you are trying to access the content from. Either the server will identify your account based on the domain you use to access it, or by asking for a username and password. Server IP Address: This is the IP address that is provided in your welcome email, and is the primary IP address for your server. Note: This will often not be the same IP address your website uses, and should not ever be used for an A record when setting up DNS for a domain. Log into your Billing Portal. Select the My Account tab, then Packages from the menu. Note: Server name will also be provided with your Server IP Address in your Welcome Email when you purchase hosting. Your server name will be provided to you in your welcome email. It will not function until your DNS is configured correctly for your VPS or Dedicated Server, as you will be able to define your own server name when ordering your server. Note: Server name will also be provided with your Server IP Address in your Welcome Email when you purchase hosting, though it will still require the configuration of your DNS. Note: If you use third party DNS, this is the IP you would use to point your domain to your server. Locate the Account Information section on the left hand sidebar. 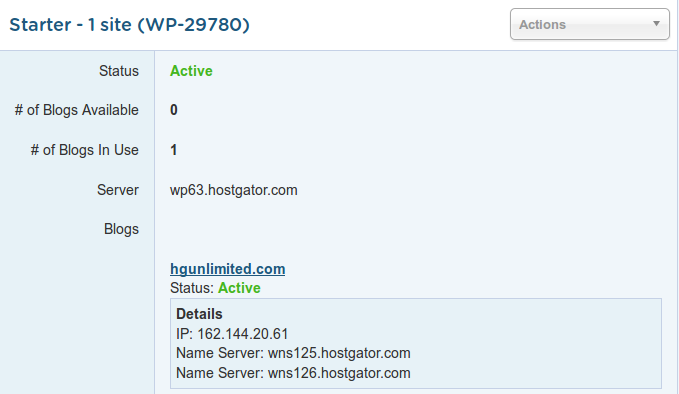 Note: The cPanel theme must be set to HG to view this section. Click the Change Style icon in cPanel to change your theme. domain.com, example.com, exampledomain.tld, etc. : These are example placeholders that indicate that any domain which you have installed to your control panel, and correctly pointed to your server by either using our name servers, or the site IP from above via third party DNS. If you need to access content on the server via a method that does not use your username and password (Such as when simply viewing your website through a browser), you will usually need to use a domain that is both installed on your account and using DNS pointed to your control panel (e.g. example.com). Any time you need to reference a tool or service on the same server, such as when configuring an SMTP plugin for WordPress, or configuring any CMS to connect to a database on the same server, you must use the server address "localhost". This is a special address that always points to the same server you are on. It will allow your software or service to link to the software or service it needs to work with on the same server without using external DNS, and can prevent many issues.